Observation - Blue egg shell - UK and Ireland. Description: Small blue egg, broken in two indicating a hatching, with hole pecked through both parts of the shell. 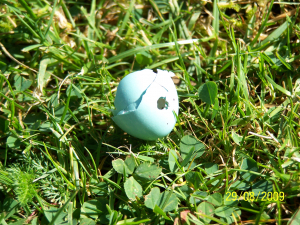 Small blue egg, broken in two indicating a hatching, with hole pecked through both parts of the shell.